It’s been just over one month since I returned from co-hosting my very first art + yoga retreat in Mexico. I’ll be honest, I was more than a little nervous about the whole thing, but things went so smoothly and all of our guests had a great time! So much so that we’ve already booked dates for 2020- but more about that later. I got into town a few days before everyone else so I could gather supplies, see friends and have a little beach time before I stepped into my role as official retreat cruise director. My flight left Portland early and I used my airplane time to sketch and plan. I mean, when you’re co-hosting an art retreat, you best be sketching your way through it, don’t you think? There’s no right way to sketchbook, it’s all about capturing moments in time, like a snapshot… or Instagram post. These first entries are far from perfect, but it’s all about the journey. I had a lovely time wandering around Sayulita, sketching, eating, drinking, people watching and most importantly sitting in the SUN. On Saturday afternoon I headed out to Tailwind Jungle Lodge to explore the grounds and get settled before our guests arrived Sunday afternoon. I’d purchased some food at the Farmer’s Market and cooked up a simple but delicious meal and sipped on my favorite mezcal, La Grimas de Dolores. I’m not sure who Dolores is or why she was crying, but let me tell you… her tears are delicious! After a peaceful nights sleep in Casita Pumita and woke up to the sounds of birds and the ocean below. Made a quick breakfast and hiked down to the mostly private beach to play before guests arrived. By 4:00 pm we had a full house. Our group of 9 got settled into their casitas and we all met up for dinner, catered by the fabulous Flor and Christian (yes- we had a private chef for our meals in the jungle!). We chatted, sharing tidbits about ourselves and how we all came to be in the jungle. We talked about art and family and yoga. We drank wine, and ate well. We were off to a good start. The beach that’s a 1.5 mile hike from the jungle lodge. Monday morning, and most other mornings, began with sunrise yoga on the outdoor yoga platform. Mandy’s teaching style was playful and approachable. It was the perfect way to set the tone for the day and week ahead. Using yoga to set intentions and clear my mind was helpful for tapping into my creativity, so much so that I’m working to develop a yoga and meditation practice at home! After yoga, our chefs Flor and Christian prepared the most delicious breakfast (lunch and dinner) using fresh local ingredients. Our group had numerous food allergies and dietary restrictions, and they managed to keep track of all of them AND make food our whole group could enjoy. Once we had full bellies, we cleared off the table and practiced random mark making as a means to clear our minds and get the creative juices flowing. Think: summer camp for grown ups or your own personal art residency that you control. The gang gets crafty with paint, sketchbooks, and collage. 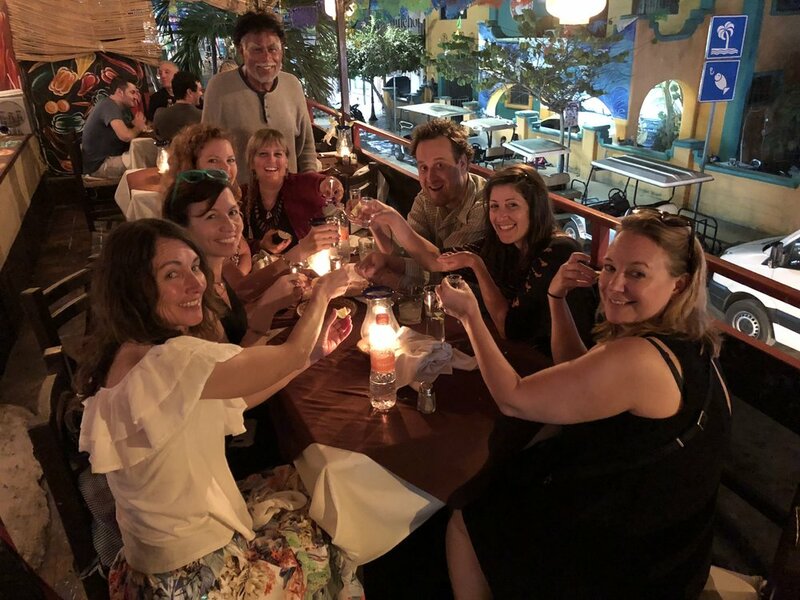 We took a little free time after art camp, before hopping in the van and heading into Sayulita to explore, meet artist Cori Jacobs and see her gallery, and have dinner. We packed a lot into the first 24 hours! Stay tuned for more about our retreat adventures. I’ll be sharing more photos and anecdotes over the next few weeks. You can also follow the retreat page on Instagram @artandyogaretreats If you’re curious about coming along next year, don’t hesitate to get in touch. You can learn more here﻿.